For the fundamental truth which most commentators continue to overlook is that the global financial system is much more like our illustrative friend Panic Pete than an elephant. 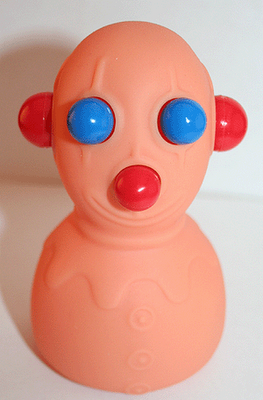 When you squeeze Mr. Pete in one spot, the squishy gel inside his rubbery body causes his other parts to bulge out. Squeeze him in those newly bulging areas, and he will return to his original form or bulge unexpectedly in new directions. Why? Because the gel inside of him is incompressible. Squeezing the flexible outer skin does not cause the toy to shrink. It just forces it into a new configuration. Likewise, the fundamental quantity in the global financial system which we are concerned with, and which we properly wish to control, is risk. But, given any specific level of return, risk is incompressible. Risk exists, and someone must assume that risk. The risk, depending on who assumes it, and at what price, generally, but not always, governs your returns. Too high a price paid, and your returns will likely be disappointing. This is of course the conundrum that the financial markets currently find themselves. The market price for assuming risk is very high, suggesting that the potential returns will be low. The bond market, offered virtually no returns at all, but, as should be realised, this does not mean low risk, risk, never disappears. Equities, while containing risk, also offer potential return, that far exceeds the return available for assuming the same risks. Therefore, currently, the equity market is, in absence of sufficient return, a buy. Demonstrated preference, always trumps stated preference. 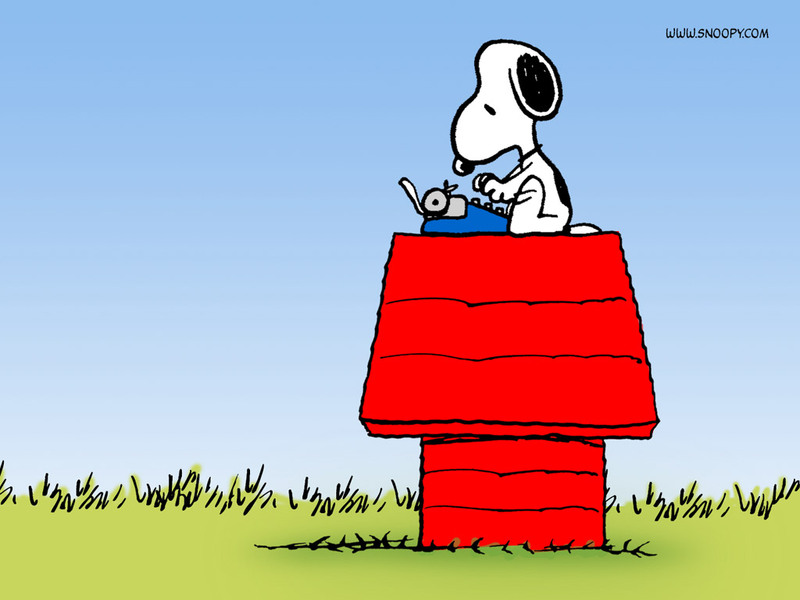 Statements are unreliable, can change, whereas demonstrated preference indicates action, which is quantifiable and real. Of course, there is another option, one that is boring, but, cash is a position. When opportunities are numerous, I am more than willing to part with my cash. But when yields are low, and valuations are high if profit margins mean-revert, I would rather have more of a cash buffer. Now I hold an approximately 40% cash position. This can be observed via the link to m@rketocracy which tracks the portfolio returns and allocations. I have been building a cash position as I was expecting an equity decline. I still carry enough exposure to participate on any market rally, or, continuance within this cyclical bull market. I am also prepared for a significant decline. In a decline, I doubt, at this point an absolute return could be achieved, however relative returns would be superior, which is a slight comfort, in a world of risk. QE2 for the most part is complete. There are another $5 billion to $10 billion purchases to be made July 11 and 13, and it’s all-over-red-rover. What are Bond yields telling us? Higher. 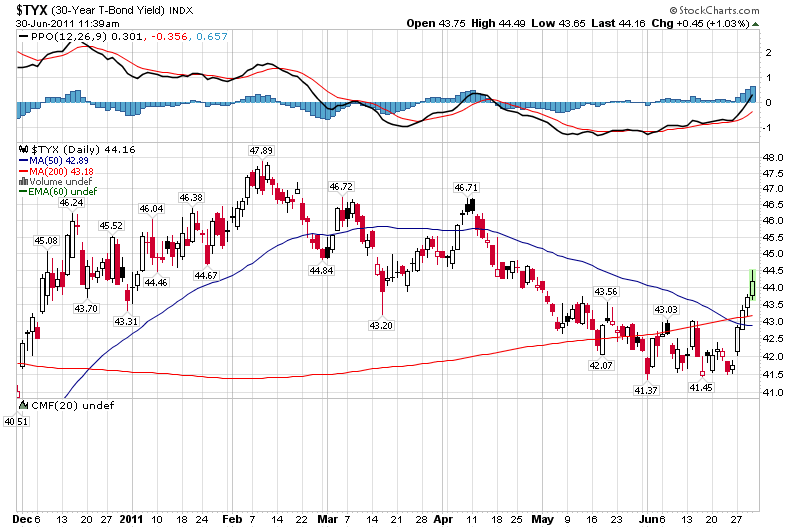 For yields to move higher, there must be more sellers than buyers. Meanwhile the stockmarket moves higher. 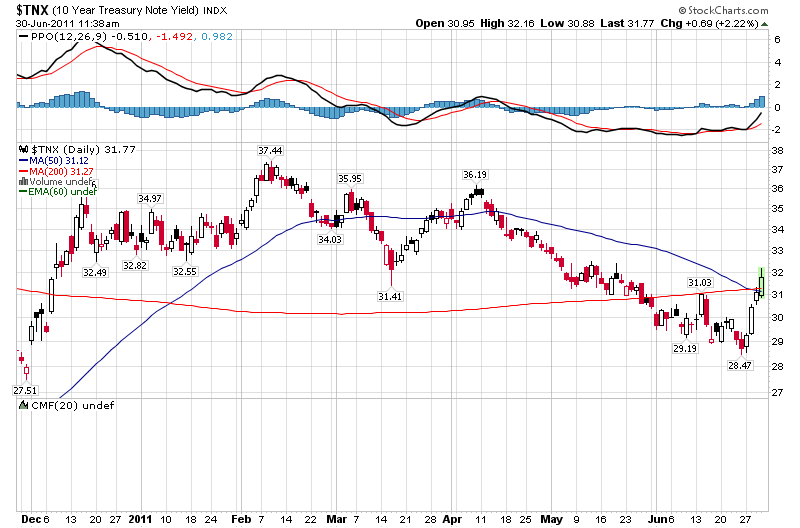 This could continue until the yield in real terms turns positive. 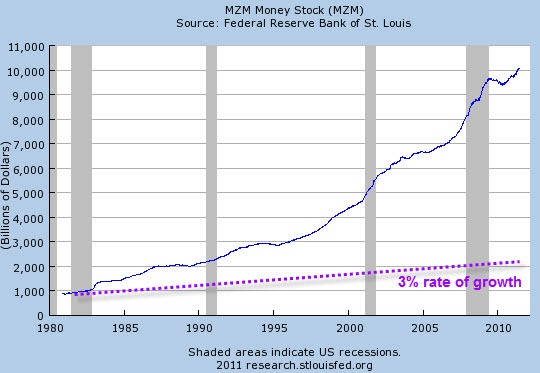 With the end of QE2, the money creation will slow. Until the next data release, detailing the inflation rate, and this is not the CPI, that rate can only be a guess. For arguments sake let’s say it is 5%. Once yields rise above 5% + a risk component, say 3% for a nominal 8%. Of course, the Federal Reserve will not let the 90 day rate rise, which normally would reduce any spread across the curve detaching to such levels. It remains to be seen how they continue to trade. It is of course, distinctly possible that stocks run higher. This is definitely not what I expected, but, that possibility has to be now considered. Although unexpected, it would be welcomed, certainly by myself. 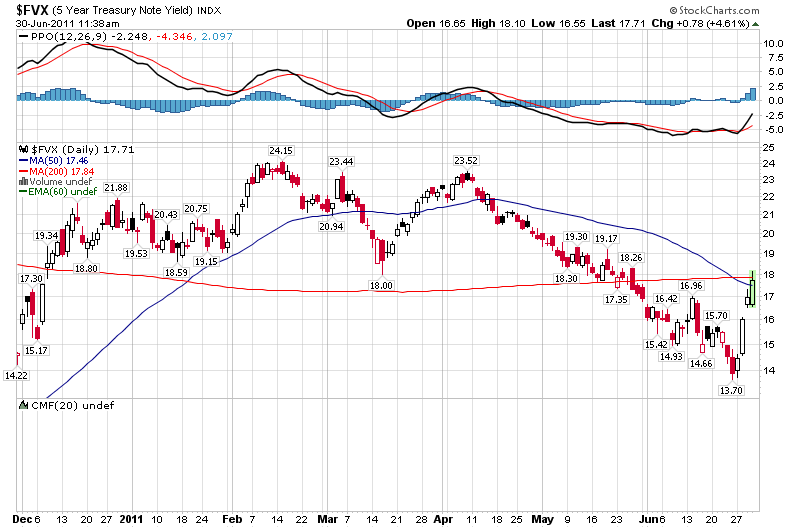 However should yields continue higher, at some point this would become a major issue for the stockmarket. The natural rate of interest, which approximates the profit margins of business, is higher than nominal rates, which have been far below the inflation rate. If the inflation rate falls, the nominal rate rises, what happens to the natural rate? Will the other rates overshoot? Will the natural rate fall? The answers are certainly not clear currently, whether any clarity develops, we’ll probably have to assess in the Q4 earnings reports. That could mean a stockmarket rally through to the Q4 earnings. An Option trade strategy, or rather strategies, explained by this lassie. Of much more interest is that the article really is nothing more than a plug for a methodology, or rather an indicator is a more accurate description, which is detailed below. I shall read through it and make comment later. The slightest edge. That’s what every trader looks for. But there’s no Holy Grail that guarantees success in trading and investing, and the fickleness of the market guarantees there probably won’t ever be one. However, our unique methodology provides a leg up on the competition. At Schaeffer’s Investment Research, we’ve found an advantage in an area that until recently was generally considered nothing more than hocus pocus – sentiment. When combined with fundamental and technical factors (a 3-tiered methodology we call Expectational Analysis®), sentiment becomes a powerful tool for analyzing stocks, sectors, or the overall market. What exactly is sentiment analysis and why do we consider it so important? Investor sentiment is simply the collective feelings, moods, beliefs, (and in some cases actions) of investors (from the smallest individual investor to the supposed “smart money” of institutions). The most accurate sentiment indicators generally reflect what a group of investors is actually doing as opposed to what they’re feeling and saying, although the latter also has a degree of validity. There’s no such thing as an infallible indicator, and sentiment is no exception. But without a feel for the expectational environment surrounding a stock, analysis (be it technical, fundamental, or a combination) is simply not firing on all cylinders. Very often it’s the expectational – or sentiment – backdrop that makes the difference between a good market call and a bad one. For the other stock, there could have been a prevalent concern about a company’s fiscal health and some expectations that earnings might fall short of the mark. The result? 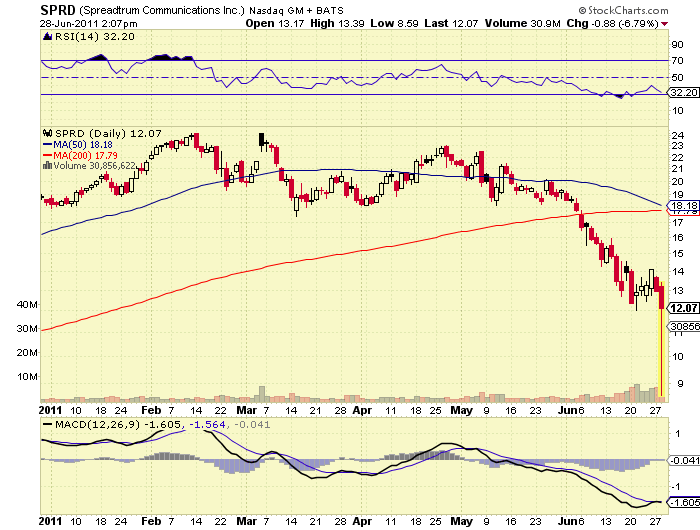 Increased put buying and shorting activity, which is eventually unwound should the company exceed lowered expectations. Why are expectations so important? Because the price of a stock represents investors’ perceptions of reality and often these perceptions are excellent contrary indicators. A stock with relatively low expectations stands a good chance of rallying, as the price will rise from this artificially low level to one that reflects the “real world.” Conversely, high expectations can put downward pressure on a stock, as the price adjusts itself lower from its unrealistic heights to better match reality. Put another way, low expectations translate into potential buying power, as skeptical investors (and their money devoted to investing) wait on the sidelines, ready to bolster a stock’s appreciation by buying up the supply from profit-takers. This excess demand drives the price even higher. On the other hand, high expectations usually mean that much of the sideline money has already been committed to a stock. Buyers are now scarce and selling will predominate on any perceived negative news, leaving the stock more vulnerable to a significant decline. One of the most important tenets of our Expectational Analysis® approach is that the power of a contrarian indicator is much greater when the underlying sentiment runs counter to the direction of the stock. For example, pessimism would be an expected reaction to a downtrending market and would therefore not be a valuable contrary indicator. On the other hand, skepticism in a rising market is a powerfully bullish combination, as market tops are not seen until optimism reaches extreme levels. Investors are normally quite bullish during bull markets and quite complacent and relatively lacking in fear on pullbacks in bull markets. It then becomes an art for the sentiment analyst to determine when this bullish sentiment has reached an extreme, at which point buying power will have become dissipated to such an extent that the market will top out. But when negative sentiment accompanies a bull market, the task of the “sentimentician” becomes much easier, as it is thus clear that buying power has not yet been dissipated and that the bull market has farther to run before potentially topping out. True Expectational investing does not mean simply buying a stock or index because no one likes it. By some definitions, a “contrarian” investor would simply scoop up out-of-favor securities, but just because stocks are out of favor doesn’t mean they are on the verge of a rally. In fact, negative sentiment is certainly warranted on poorly performing stocks or sectors, and if a stock is displaying weak price action, there may certainly be a reason for it. Negative sentiment alone is not enough to predict when a stock will turn around, and positive sentiment is not enough to gauge when a stock may start to roll lower. After all, even exceptionally depleted selling strength will keep a stock moving lower as long as it exceeds the comparable buying strength. A trend that is nearing its conclusion cannot be distinguished on a chart from a trend that has a long way to go in price and time. In fact, there is an old saying in technical analysis to the effect that “the chart looks prettiest just ahead of a top.” But sentiment indicators can help you distinguish the pretty chart that is going to remain pretty from the pretty chart that is about to turn ugly. In the papers, on the financial news networks, and on financial websites, the term “sentiment” is cropping up more and more frequently these days. We take this as a broad sign that analysts are finally beginning to admit that there is more to the stock market than just fundamentals and technicals – something Bernie Schaeffer has been shouting since 1982. The true pioneers of Expectational Analysis®, Bernie and his research staff have tested and developed many qualitative and quantitative methods to evaluate sentiment. The distinguishing difference is that indicators used at Schaeffer’s Investment Research do no reflect only the overall market, but individual sectors and stocks as well. Read on to learn about some of these sentiment indicators and how they can be used to improve an investor’s trading results. What does 3% inflation look like? They found that the injection of fiat money through bank credit expansion lowers the market interest rate to below the natural rate level — as the Swedish economist J.G. Knut Wicksell (1851–1926) called it — that is, the interest rate that would prevail had the credit and money supply not been artificially increased. The artificially suppressed interest rate makes firms increasingly shift scarce resources into more time-consuming production processes for capital goods at the expense of production processes for consumer goods, causing intertemporal distortions of the economy’s production structure, leading to malinvestment. Fiat-money injection increases consumption out of current income at the expense of savings, and, in addition, leads to higher investment, so that the economy enters an inflationary boom, living beyond its means. If the injection of fiat money created through bank-circulation credit out of thin air were a one-off affair, it presumably wouldn’t take long for the artificial boom to unwind. A recession would restore the economy to equilibrium as people returned to their truly desired consumption-savings-investment relation (as determined by time preference). In a fiat-money regime, however, increases in credit and money are not a one-off affair. As soon as signs of recession appear on the horizon, public opinion calls for countermeasures, and central banks try their best to “fight the crisis” by increasing the fiat-money supply through bank-circulation-credit expansion, thereby bringing interest rates to even lower levels. 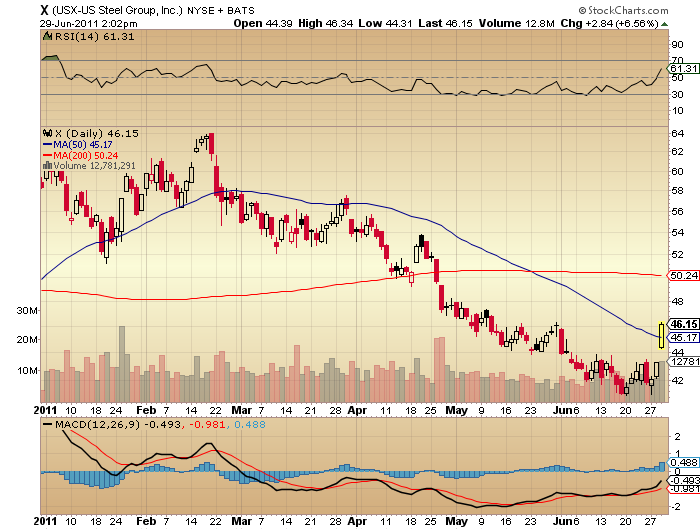 US Steel having a little run higher today. Offsetting some of the weakness in my airline stocks. Another Chinese burrito stock, given the kiss of death from Muddy Waters. I thought I would have a look and run the numbers. The numbers are suspect and not good. This is definitely not a buy long on a possible turnaround. You’ll probably do better actually going short. Muddy Waters include a letter to management detailing their analysis, looks pretty reasonable, contains a number of red flags, so their analysis certainly confirms my faster and less thorough analysis, but the result is the same…avoid. What’s your point? That you think int rates will surge? The onus is on the fear mongerers to tell us how this insolvency will happen. But be forewarned – I will prove your every point wrong. Really. I have yet to see him prove through reasoned argument, backed with facts, empirical or a priori, anything. His usual approach is some ad hominem, judicious editing and nothing. On occasion, one or two of his dimwitted readers makes it this far and offers up some truly lame arguments. Cullen declined my offer of a couple of posts on his blog to address this very challenge that he proffers currently.